Tomorrow is May. Hard to believe isn’t it? I know I’ve mentioned this a tad, but I’m REAL excited for summer. Reason #1: The WHOLE family is going on a summer vacation this year. This alone is reason to celebrate. I was visiting with the babies (20 & 22 respectively) about family vacations and recalling how long it’s been since we’ve done one. Well, it looks like this is the year. 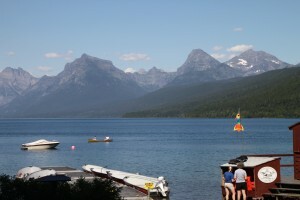 And we’re vacationing here at home with plenty of time spent on Flathead Lake, Whitefish Lake and Glacier National Park. Reason #2: It’s the 100th birthday of Glacier National Park! And to celebrate, numerous events and activities are scheduled for in and around the park, including the official rededication on May 11, the Huckleberry Festival (I heart huckleberries) and the Centennial Hootenanny (which by its name, sounds like something I’d be into). Lake McDonald. If you can\’t find me this summer, you may want to look here. 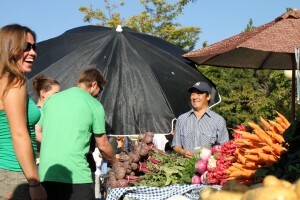 Reason #3: Farmers Markets. Plain and simple, I love these. It doesn’t matter where, when or how. If there’s a local market, count me in. Reason #4: These two jokers are coming to play with us! They live far away and we don’t see them enough, so we’re excited for their visit. For now, I’ll keep counting down the days. And maybe go paddle a canoe in this late spring snowstorm. Oh wait, I did that yesterday! This entry was posted in Summer and tagged Glacier Centennial, Glacier National Park, Musings, Summer on April 30, 2010 by tiatroy.